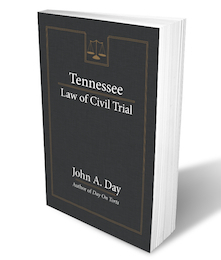 Tennessee Law of Civil Trial | Nashville Accident Lawyers The Law Offices of John Day, P.C. Let's face it: getting ready for trial is hard. So much work needs to be done. Exhibit binders need to be prepared, witnesses need to be prepped, motions in limine need to be drafted, subpoenas need to be issued, jury instructions need to be submitted, trial briefs need to be written, voir dire questions need to be developed, opening statements need to be crafted, direct and cross examinations need to be prepared, and so forth and so on. And, of course, all of this work needs to be done while still handling all of the normal day to day legal work such as client meetings, motion hearings, phone calls with opposing counsel, the endless onslaught of emails, etc. By the time you get to trial, most lawyers are tired and stressed. Then, trial starts and you are working grueling hours and trying to address last minutes issues that arise such as juror questions. As we like to say at The Law Offices of John Day: there is a reason they call it a trial. Finally, as any trial lawyer knows, the work is not over after the jury returns its verdict. Any number of motions may be warranted such as a motion for JNOV, motion for new trial, motion for additur, etc. Needless to say, if you can streamline any of part of this process or quickly respond to an unexpected issue, you want to do it. We hope this book will help you be prepared and ease some trial stress. It can be used as you prepare for trial or it can be used in the courtroom to quickly and easily address any issues that develop or it can be used during the post-trial motion phase. This 500+ page book provides you with a quick and thorough explanation of the law of trial from pretrial conferences and voir dire to jury instructions and motions for new trial. In addition to providing you with the law you will need, the book also includes 75 of John's personal trial preparation tips, forms and checklists.